I bought this especially for DRC while I was in London the day before the meeting at which it was to be played. Finding a record shop in Covent Garden proved more problematic than it used to, as they’ve seemingly all been replaced with Fred Perry vendors. I was wearing a Fred Perry at the time and felt this was a bitter irony directed personally at me. Apocalypse! was still shrink-wrapped when I arrived at Tom’s house, as per instructions to bring something unplayed. I’d not heard a note, though I had read a couple of things which pointed out longer songs and looser structures than Callahan had used before. I only started listening to Callahan once he started using his own name; I’ve heard, to my knowledge, no Smog records at all. I quite like Woke On A Whaleheart, but I adored Sometimes I Wish We Were An Eagle, so I was looking forward to Apocalypse. Tom has asked that we only write these pieces after six listens; I’m on two plays (DRC and one other), but frankly if I wait for six it’ll never get done, and anyway, Zaireeka really strafed everything else played or discussed last Thursday into tiny little bits. And what’s DRC without some rule-breaking? So, Apocalypse! 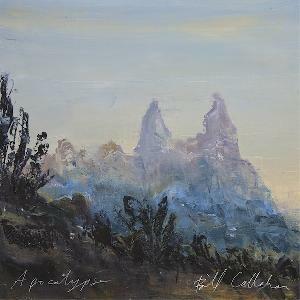 is looser, and the songs are longer, Callahan’s voice is still deep and rich and dry and wry and, to my ears and brain, more than a little sardonic. I had an interesting twitter chat the other day with someone from The Quietus and someone from NME about whether the song America (and specifically its lyrics) is good or bad, or funny, or ironic, or heartfelt. We concluded that it is good, and funny, and ironic, and heartfelt, all at the same time. I am struck for some reason, and I’m not sure why, having played them both back-to-back at the weekend, that Apocalypse! is “about” guitar, both texture and melody, in the same way that …Eagle is “about” drums, both dynamics and rhythms. I’ve enjoyed it thoroughly both times I’ve played it, and I look forward to playing it more – it feels very much like a grower, although the textures, instrumental variations, and words are appreciable from the off. But I need to write this now, because it’s hanging over me like a piece of homework and I need to blitz it out so I can get onto my next thing I want to write. Tom Listened: This was brilliant and I am going to buy it. On vinyl. So there. (Footnote: Both the Kurt Vile album and this had at least one song that had a ‘Van Morrison when he was good’ vibe going on. Strange as he has drifted out of fashion in recent times – when I started getting interested in alternative music, back in the late eighties, most issues of Melody Maker would mention Astral Weeks at some point or other. Thought it was worth mentioning – possibly another DRC weird coincidence? ).